We’re a little behind on recipe posts this autumn – I do apologise – which means that the best of this year’s figs might have come and gone. If you can nab some, especially the Turkish ones, go get! We made this salad by combining some classic fig-related ingredients and adding another one, butter beans. Figs and feta? Of course. Honey roasted figs? Naturally. A little mint with that? Oh go on then. But butter beans? Really? 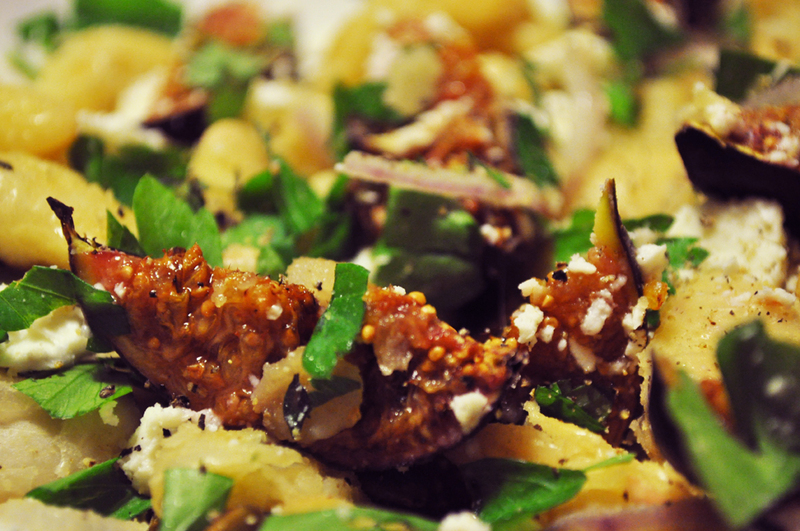 Well, take out the figs and the butter beans fit this recipe fairly obviously. So, we threw them all together. To begin, quarter the fresh figs, drizzle with a little runny hunny and ‘roast’ in the oven on an oven tray for around 15 minutes on a medium heat until the flesh has warmed and softened and begun to caramelise on the surface with the help of the honey. In the meantime, add a little olive oil to a wide frying pan, add two tins of drained organic butter beans and cook them gently for a few minutes until their skins begin to turn a golden brown colour. Remove from the heat. 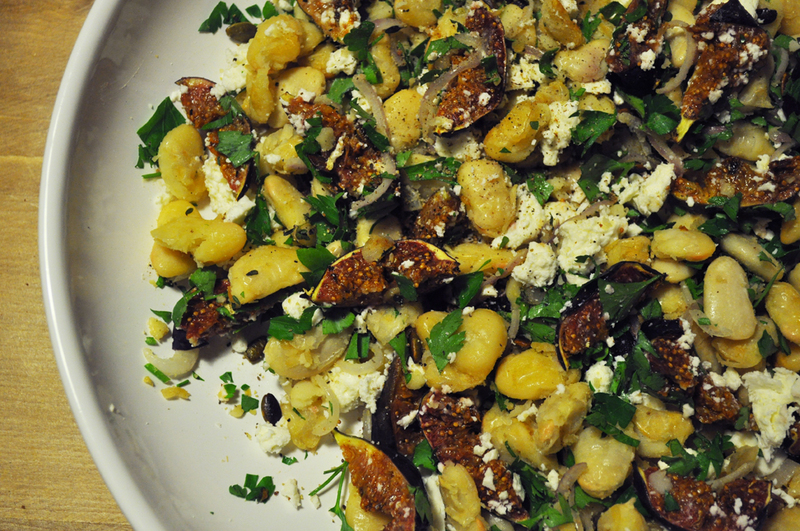 In a large, shallow salad bowl, combine the roasted figs and butter beans. Crumble in a block of feta cheese and a small handful each of chopped fresh mint and flat leaf parsley. And that’s it. Eat just warm or at room temperature. It’s like a ray of sunshine from the middle east cutting through a British autumn mist. 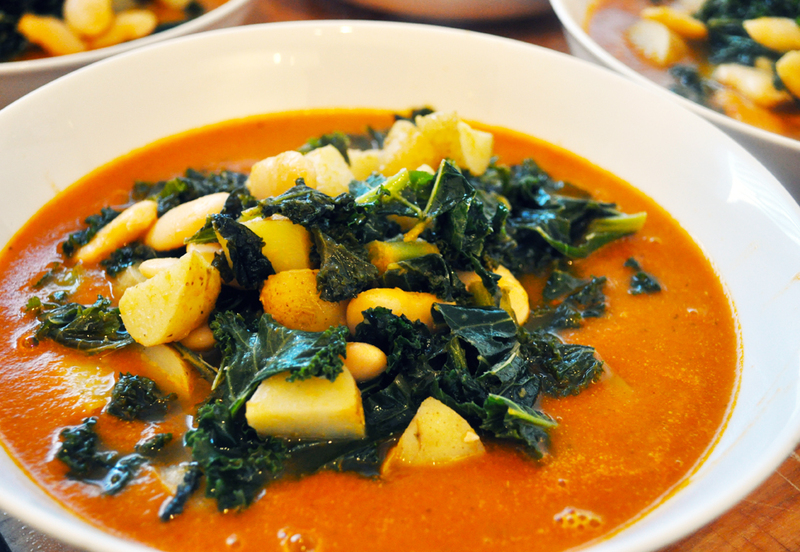 Caldo Verde is the Portugeuse soup of potato, onion and kale. Recipes vary for it, sometimes meat is added to it, sometimes garlic, and probably loads of other things too. But the essential items are the greens of the leaves and the whites of the potatoes and onion. In a large stockpot, fry a sliced onion in olive oil for five minutes, then add a clove of finely chopped garlic and cook for a further three minutes. Next, add some halved new potatoes, or quartered potatoes if they’re larger. Floury potatoes are good here as when they start to break up they’ll thicken the sauce. 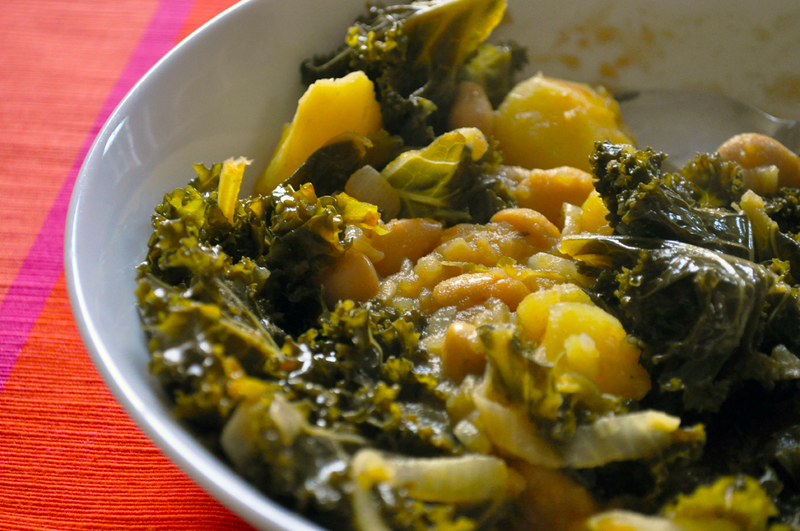 Then add some roughly chopped kale, any thick stalks removed, a tin of white beans of your choice and a level dessert spoon of paprika. Finally add some vegetable stock, which should come up about level with the top of all the veg. Bring to the boil and then simmer for 20 minutes. When the potatoes are soft you might want to crush a few of them in the pan and then stir – it’ll thicken the sauce a little. Serve with crusty bread and a final drizzle of olive oil. Believe it or not this hearty yet summery supper came about as a way of emptying our fridge and store cupboard before our impending move from the city. It’s typical that we would have a couple of peppers, some tomatoes, a few old spuds and half a cabbage (or similar) lying around. It’s also typical that this is the kind of thing we’d end up making with those ingredients. The first job was to roast a red and a yellow pepper, just coated with a little olive oil, along with a couple of chillis and three cloves of garlic, still in their skins. Also into the oven went a small tray of halved tomatoes, skin side down, drizzled with olive oil and seasoned with salt and pepper. They both need to roast at around 190 degrees for 25 minutes or maybe a little longer. The tomatoes should be starting to collapse and the peppers’ skins almost blackened in parts. When done, drop the peppers into a plastic bag, tie it and leave to cool/steam for a few minutes – this will help loosen the skins a little. Leave the tomatoes to cool a little, in their roasting tray. After 5 minutes or so, take the peppers from the bag, slice them open, deseed them and peel as much skins from them as you can (but don’t worry too much if some skin remains). Slip the garlic cloves from their skins and chop the stalks off the chillis. Tip all the roasted veg into a food processor and blend until smooth. Next, pour the roast veg sauce into a large saucepan/stockpot and add 400ml of water or vegetable stock. Heat until it comes to a boil and then leave on a slow simmer. It should look like a rustic tomato soup. Now, take your potatoes and boil them until just tender and steam whatever greens you have (dark green cabbage, kale or cavolo nero), stalks removed, for around four minutes or, again, until just tender. Tip the potatoes and greens into the soup along with a tin of butter bins (other white beans would be fine here but the size of the butter beans is good with this) and simmer for five minutes. Serve, if you like, with crusty bread. Depending on the exact amount of ingredients this will turn out more like a stew or more like a soup. I don’t think it really matters. What counts most of all is the deep, rich flavour and aroma of that roast tomato and pepper broth. One final thing: we’ve described this as summery. Why? Well, because ripe summer tomatoes and the ‘new’ potatoes we used seem to shout of that season. But this is a dish that translates to autumn or winter too. I’d try to make it more ‘stewy’, less ‘brothy’ for those darker months. Last night’s concoction came about after staring long and hard at the contents of our weekly delivery from Abel & Cole and then leafing through some of our recipe books. 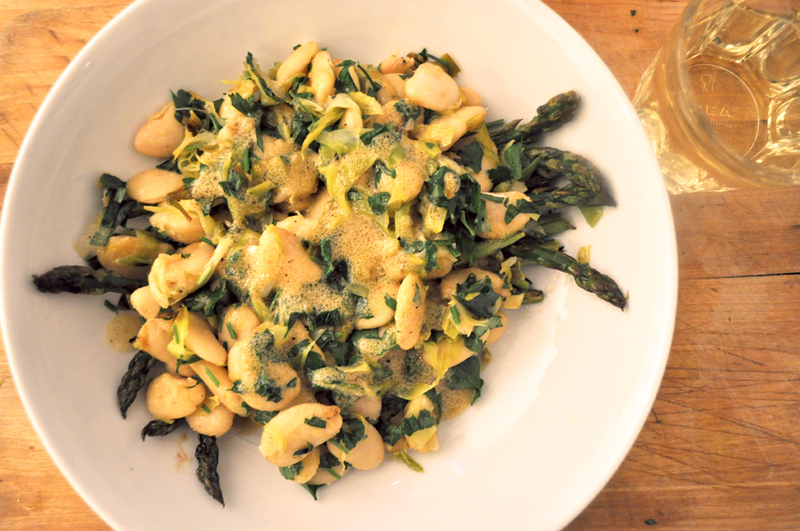 Hugh Fearnley-Whittingstall suggests a white bean and leek salad, and this is an adaptation. A very simple spring supper. To begin, soften the leeks in a large pan with some butter and olive oil. (I think we used to call this ‘frying’, but no one seems to advise ‘fry’ in recipes any more. You can soften, wilt or cook, but you can’t fry.) Then add two cans of butter beans. Season and cook for ten minutes until the beans take on a little colour. You can then boil, steam or grill a bunch of asparagus – which makes a warm salad bed for the beens and leeks. For a little tang we drizzled the salad with a mustard dressing made from Dijon mustard, olive oil and a little white wine vinegar. That should really have been cider vinegar but we didn’t have any. A Sunday supper supreme. This really has become a favourite of ours over the last year. It’s based on an old Ottolenghi recipe you can read here. I think there’s a version of it in his book Plenty, too. Basically, it’s butter beans fried in a little olive oil and/or butter, with spring onions (sliced length-ways and added to the beans for a couple of minutes towards the end of their cooking). The beans are then left to cool, a heap of chopped herbs are added (sorrel, dill, flat leaf parsley, basil?) 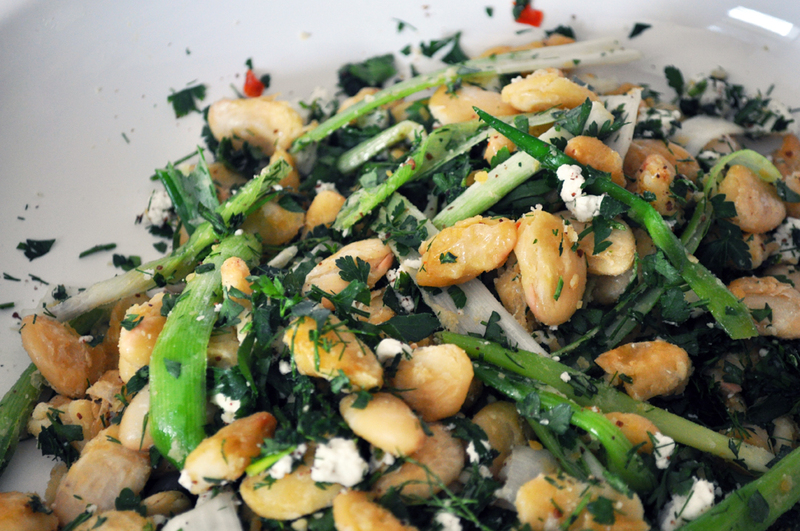 Then crumble some feta in, sprinkle some sumac and add a chopped chilli if you like, We like. C’est ca.